Mechanical reasoning tests measure your knowledge of straightforward mechanical and physical concepts. They do not measure your underlying mechanical aptitude in the same way that abstract reasoning questions measure your underlying intellectual ability. You may have come across: levers, pulleys, gears, springs and simple circuits in elementary science and the questions on these topics are fairly straightforward. If elementary science classes seem like a long time ago then you may need to refresh your memory. If you are taking a mechanical reasoning test as part of the selection process for the emergency services or the military then the questions you can expect will tend to concentrate on principles rather than on making calculations. For example, you may be shown 3 diagrams of a lever and asked which one is the most efficient. This is very different from craft and technical tests where you will usually be expected to make calculations. If you are taking a test as part of the selection for a craft or apprenticeship job, then you may be asked some questions about tools and how they are used. You should also expect some shop arithmetic questions. These questions approximate the type of reasoning and maths that are needed to estimate materials costs etc. 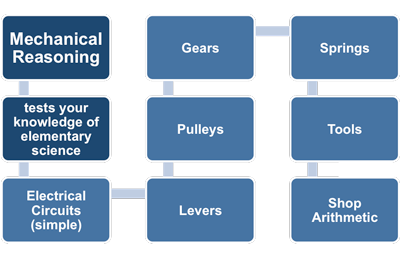 Many of the questions in mechanical reasoning tests are ‘industry’ specific. For example, tests used by the fire service tend to frame the questions in terms of fire-fighting whereas tests used to select for an aircraft maintenance job would tend to frame the questions in aviation industry terms. It doesn’t matter if the questions you practice on aren’t specific to the industry you are applying for. It is the substance of the question that is important – the scenario is incidental.